Todays post is going to be a reveal of what was included in October LookFantastic Beauty box and tomorrows post will be on Novembers Box! 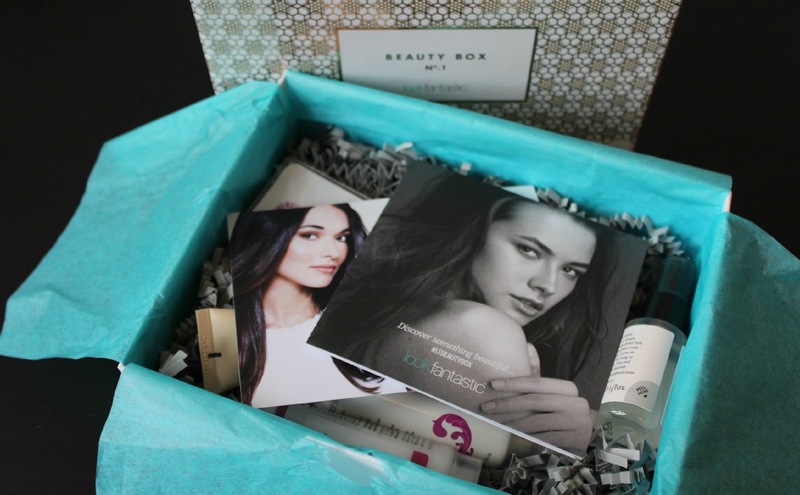 The LookFantastic beauty boxes are £15 per month with free delivery- the price drops depending on the amount of time you sign up for too. 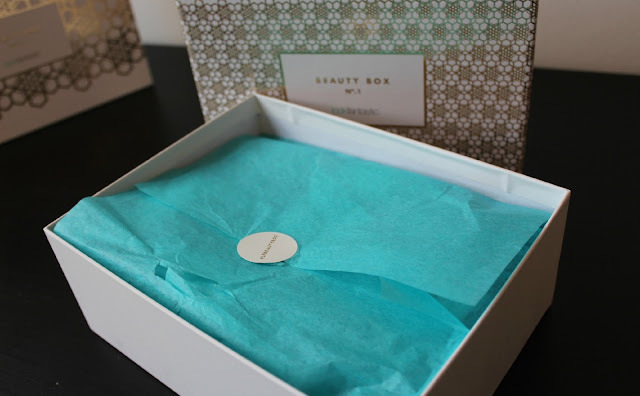 The October box contained approx £50 worth of beauty products all packed in a rather luxurious gold detailed box and some turquoise blue tissue paper. Inside the box, before you get to the good stuff are two leaflets; one on the contents of the box and the other detailing a promotion LookFantastic have on at the moment. Ohhh look at all those treats! The October box seemed to be focused on luxury skincare and a few additional bits for your beauty collection. Monu Firming Moisturiser 25ml sample (50ml £22.50) Although I haven't had this product long enough to comment on its effectiveness what I can say is that it smells gorgeous. Its described on the packaging as containing aromatic Neroli and Lavender essential oils. The firming cream also contains glycerin to soften and moisturise your skin when applying after cleansing and toning either in the morning or at nighttime. If your also looking for a product to smooth fine lines and protect you from the sun this Monu moisturiser also contains collagen and protection from UVA and UBV rays. Nuxe Rêve de Miel Hand and Nail Cream 15ml sample (50ml plus lip moisturiser for £9.00) Firstly, what a bargain gift set is that!? This hand and nail cream is lovely and soothing on my dry chapped hands. I've been using it for a couple of days now and really rate it. I like it because its non greasy and the hint of honey smell is rather divine. The cream is packed with sunflower, honey and essential oils to make sure your palms are kept tiptop during the cold weather! Elemis Hydra Balance Day Cream 20ml sample (50ml £42) This, for me, is a pretty luxury skincare item with a price to match but the product definately packs a good moisturising punch to my dry winter skin! This moisturiser is designed for normal to combination skin and contains meadowsweet extract which is said to regulate oil production. It also contains hyaluronic acid to help lock in moisturise. I'm not 100% convinced on the scent of this cream but Im going to stick with it and see whether I notice its effects over the next few weeks, You only need to use a tiny pea sized amount per use so its going to last me a while thankfully! Balance Me Radiance Face Mask 30ml sample (75ml £18) I've, in the past, posted about Balance Me so I was excited to see a Balance Me product in the beauty box. I like to have a whole collection of different products from a beauty range and this has been added to my Balance Me stash. I've used this face mask in the past and I find, instead of using it as a mask, it works best for me as an exfoliating face wash. It's meant to be a duel purpose product and I like to use this once or twice a week to rid my dry patches that foundation tends to cling to. The face mask contains ground walnut shells to give you a good scrub and, as always with Balance Me products, it doesn't contain any nasties like parabens and sulphates. Murad Exfoliating Cleanser 30ml sample (200ml £34) I'll admit, with having to try out all the other products in the beauty box, I haven't got round to trying this one out on my face yet. I've just had a bit of a test on the back of my hand and my first thought is that it doesn't feel as exfoliating as the Balance Me face mask and leaves little gritty bits on your skin if not removed fully BUT the reviews on the LookFantastic website for this cleanser are all very positive so I shall try it out and let you all know how I get on. PHEW.. so, as you can see, lots of skincare items to be going on with for a while! 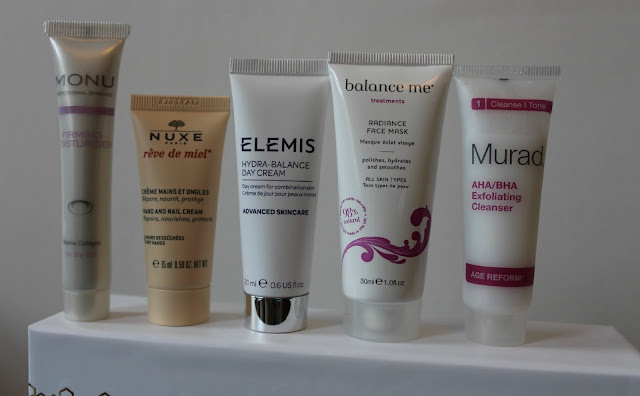 The skincare product that stands out to me the most is the Monu moisturiser, it smells the clean and fresh (huge points on smells from me!) and feels very velvety and smooth. Percy & Reed No Oil Oil 30ml sample (60ml £14) I've previously received a sample size of this in my Elle magazine and I love it! I've started to use hair oils over the past few months. 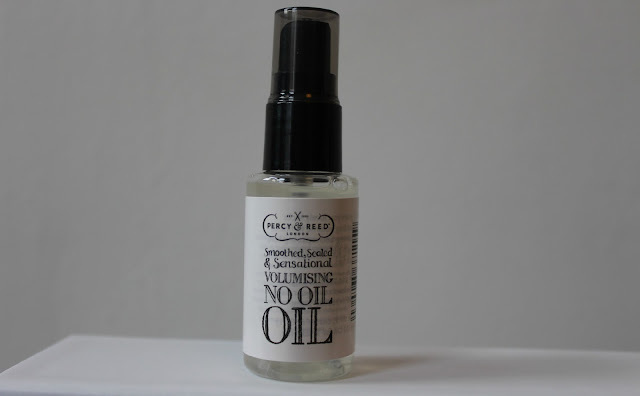 I have my full fringe back so my hair is getting washed and straightened more frequently; so I like to use an oil and this for me, is perfect. I use this on towel dry hair and when blowdrying it add a lovely salon-like scent to my locks! It seems to keep my hair in check and tackles any rogue flyaway hairs too! 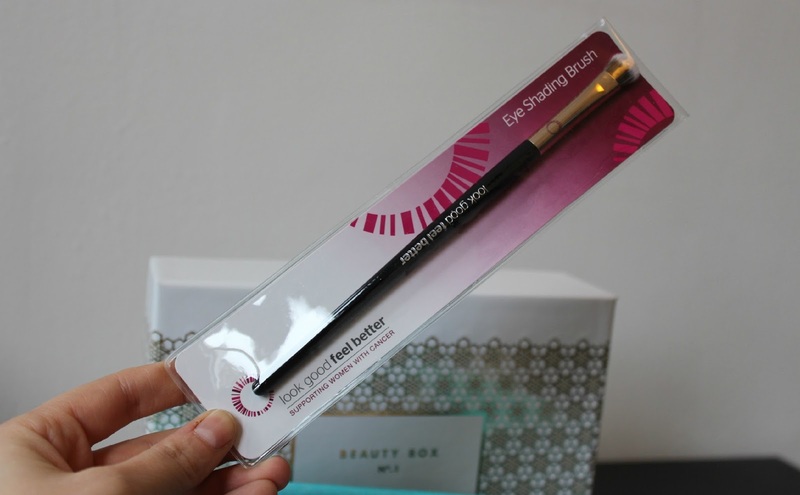 Look Good Feel Better Eye Shading Brush £6.99- You can view the whole range here. After recently going to a beauty event (blog post also coming soon!) I realised that I am seriously lacking in the eye makeup department- I only have 2 palettes that I use and I've actually been using the mini brushes that come with them. 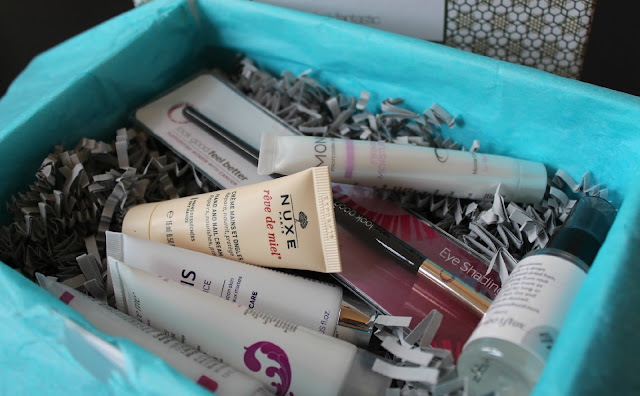 So, I was really pleased to get this inside my October LookFantastic box. The brush is soft and fluffy.. just how they should be! 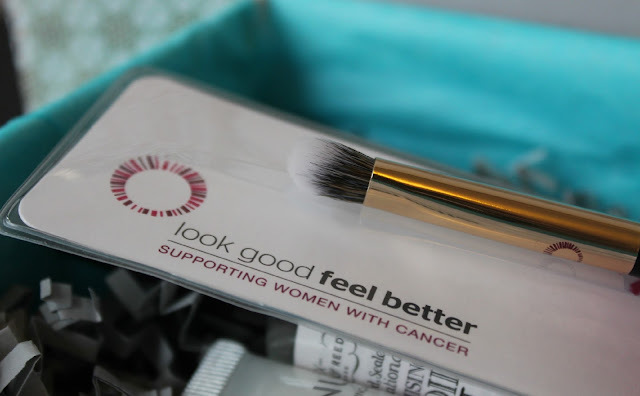 Of course its also fab that LookFantastic have pledged a minimum of £30k a year to Look Good Feel Better charity too. 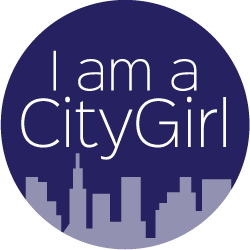 You can find out more about how they support women with cancer here. 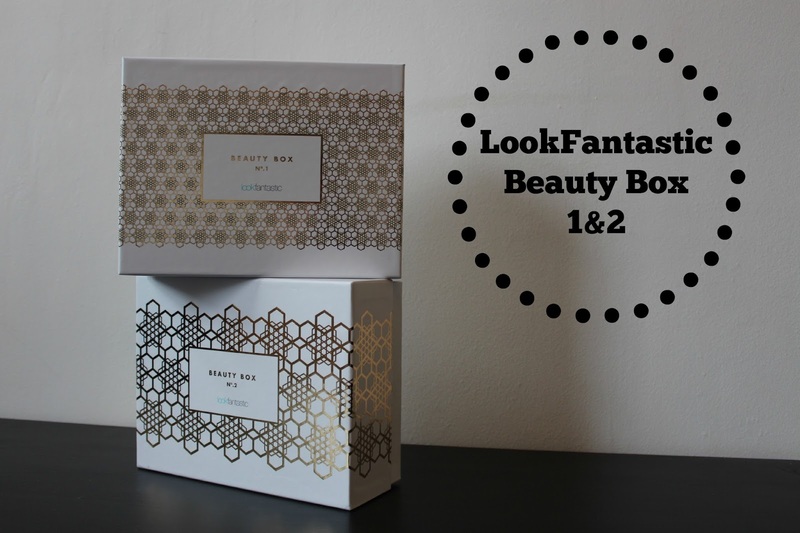 Having been a subscriber to beauty boxes in the past I feel confident in saying that LookFantastic are strong contenders in the subscription box market. The range of products in this box were more skincare based but this is a selling point to me; I love sampling new products in the tester sizes as it means I don't have to spend lots of cash only to find out it isn't the product for me. If I had to choose, my 2 fave items are the Monu moisturiser and the Look Good Feel Better eye shading brush. Have you subscribed to the LookFantastic Beauty Box? Which product from this selection would you like to try? How good is this box! I love Balance me & Murad! I was given the second box and honestly I was really disappointed, I'm selling it on, there's just nothing I want. I am a bit skeptical of these kind of boxes generally though.